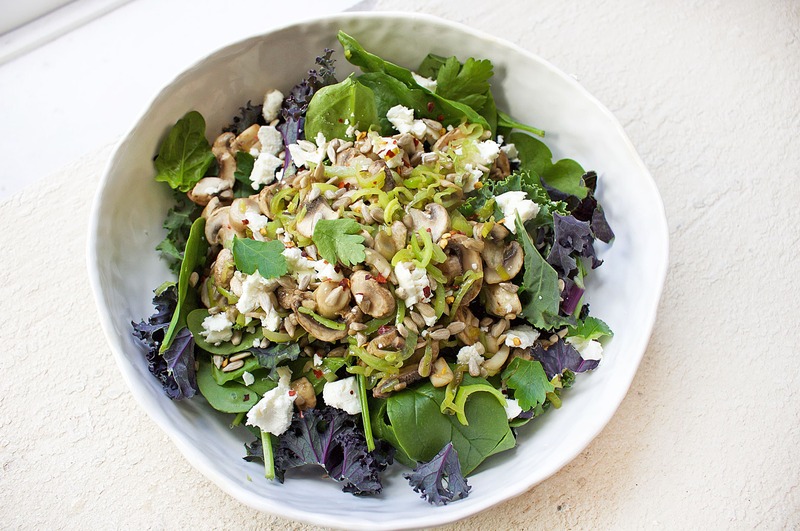 This is a perfect spring salad with lots of sautéed mushrooms and a healthy kick of chilli! Leeks are amazing prebiotics – meaning they help feed the good bacteria in your gut, which is so essential for overall health. I love to keep this as a vegetarian option, using just goat’s cheese, but you could also add some simply grilled organic chicken or red meat if you prefer. In a heated medium-sized frying pan, add 1 tbsp of olive oil then add the leeks and sauté until translucent or golden. Add the mushroom to the pan and allow them to cook well with the leeks (3-4 minutes). Season the mushrooms and leeks with salt and optional chilli. Throw in a handful of sunflower seeds to cook with the leeks and mushrooms. Add fresh mixed greens to a large serving bowl then top with sautéed leeks and mushrooms. Sprinkle with goat’s cheese and extra seeds and chilli, if using. Enjoy!